Señoritas in Blue by Israeli historian Inbal Ofer is a welcome study about the Spanish women’s division of the Francoist Falange. The organization, La Sección Femenina, was founded in 1934 by Pilar Primo de Rivera, the sister of the fascist leader José Antonio Primo de Rivera, and created to mobilize and provide a political education for women. The Sección Femenina continues to be misunderstood and its history and significance distorted by simplifications and stereotypes, despite the existence of several excellent studies by historians and Hispanists including Franco Rosario Ruiz, Celia Valiente, Immaculada Blasco, Helen Graham, and Kathleen Richmond. The richness of the existing scholarship has been Ofer’s challenge as a professor at the University of Tel Aviv. The book relies on the Sección Femenina’s archives, currently held in the Royal Historical Academy and the General Administration Archive in Spain. Ofer also uses numerous periodicals and several interviews with former leaders of the organization. However, the main value of the work lies in both the questions she poses and the new analytical frames she employs to answer them. Is it possible, she wonders, to speak of the existence of a female political elite in a regime that systematically pursued the exclusion of women from the public sphere? Throughout the book, the author not only demonstrates that such an elite could be forged despite its organic link with the Falangist Movement (the fascist single party, FET y de las JONS ), but moreover that the women Falangist leaders used their privileged position to promote an autonomous political and social agenda. The collective experience of visibility and action in public life, therefore, would serve as a crucial point of reference in the future when a set of reforms came in the late 1950s, improving the situation of Spanish women. Ofer shows intellectual courage when she goes one step further and challenges one of the premises that hovers above (but is not explicitily posited by) previous research on this topic. Given that the women’s section of the Falange promoted an agenda aimed at framing, mobilizing, and improving the material, cultural and legal conditions of Spanish women, is it correct to describe the organization as “feminist”? Ofer claims that the answer is “yes,” and thereby joins other distinguished scholars who have argued for new conceptualizations of feminism—including research by ​​Karen Offen whose writing on France in the early 1990s gave way to a paradigm shift in the understanding of historical feminism. In addition, by working with Franco Linz’s definition of Francoism as an “authoritarian” regime–as opposed to a “totalitarian” one–Ofer highlights the Sección Femenina as one of the various “political families” that supported the dictatorship and could thus negotiate positions of power and legitimate forms of activism. One way the Sección exerted its influence was in its support of the reform of the Civil Code in 1958 that modestly improved the legal situation of Spanish women and the Law of 1961 that introduced political, professional, and working rights for Spanish women. The book not only provides an overall analysis of the Sección as a historical phenomenon from a dual theoretical perspective, it also makes concrete contributions that reveal the complexity of an organization that attracted a large group of activists over the course of four decades (1937 to 1977). First, the book explores the existence of two generations of women militants consisting of the women who founded the organization and participated in the Spanish Civil War and a second generation that dates from 1947 (with the Law of Succession, when the Franco regime configured itself following a monarchic model, and thus dashed the hopes of Falangists to create a totalitarian state). Perhaps it is exaggeration to say, as Ofer claims, that the Sección was intended to be a “champion of women’s rights ” in the 1940s, but she is right to analyze the achievements of the organization in light of this tension between the female Falangist elite and the masses, the constituency from which they drew necessary support and on which they relied as a source of legitimacy in the Franco regime. The first generation included women linked to the Falange through family ties, and who had been active participants in the civil war as nurses or social workers. A number of these women had been casualties during the war and their dedication and sacrifice served as a badge of fidelity to the Franco regime. The women of the second generation tended to come to the organization seeking professional development and training, activities that garnered legitimacy through the use of the female uniform of the Sección as well as by the status conferred by flaunting a kind of virtuous spinsterhood. The author explores the ways in which gender identity appeared in publications of the Sección Femenina and concludes that the identity promoted was far from fixed or monolithic. Ofer shows how the publications encouraged a female model that subverted the traditional dichotomy between public and private, and proposed a kind of “virile” activism that is not wholly aligned with the ideal of masculinity. These publications distanced themselves from two other models of womanhood: that of the regime’s other main women’s organization, the Acción Católica, as well as from the despised left-wing (“communist” or “red”) models of female activism symbolized by the Spanish Civil War figure of the militiawoman. 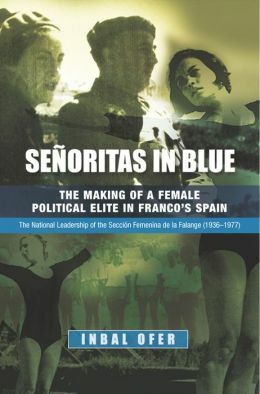 The book also traces the contribution of the Sección Femenina to legislative reforms of Franco dictatorship in the areas of gender and describes how women activists engaged with the powerful, both in official and social spheres. In short, Señoritas in Blue marks a milestone in the understanding of the Sección Femenina and the analysis of the Franco regime from a gender perspective. It not only offers a new reading, rich and suggestive of the many faces of women’s activism during Franco’s dictatorship, but also highlights the projects of this “female elite” within the regime and its capacity for empowerment. It also examines how the limits imposed by fidelity to the regime guaranteed the organization’s existence. Ángela Cenarro is a historian and teaches at the University of Zaragoza in Spain. She is the author of Los Niños del Auxilio Social (2009) concerning the main child welfare agency under the Franco regime.